The place seems to have been completely destroyed during the Jewish wars, and on its site another city was built by Vespasian (72 C.E. ), to which he gave the name "Neapolis" ("B. J." iv. 8, § 1; Pliny, "Historia Naturalis," v. 13, § 69); this was afterward changed by the Arabs to "Nablus." 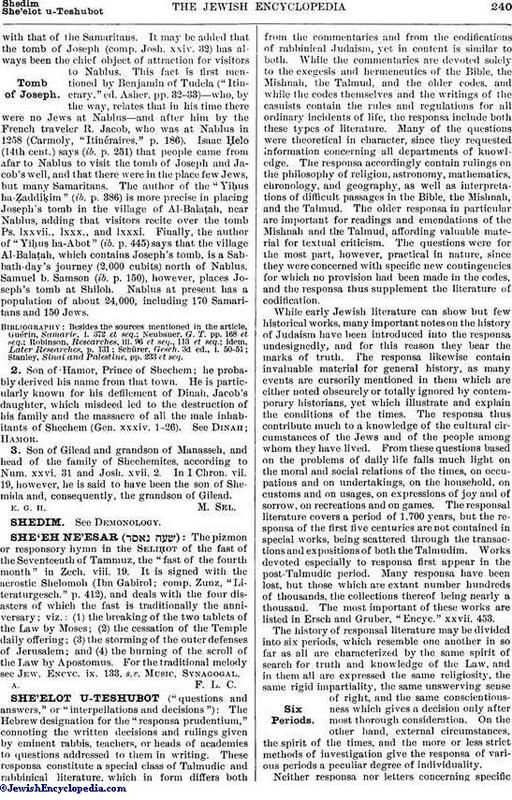 The identification of Shechem with Neapolis by Josephus and Pliny is supported by Num. R. xxiii. 14, which renders "Shechem" by "Neapolis" ( ). 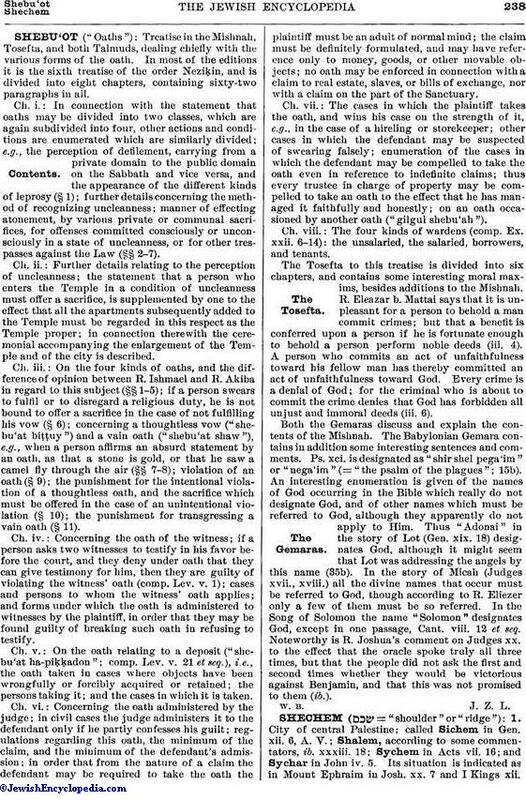 Eusebius ("Onomasticon," s.v. "Sichem"), however, places Neapolis in the vicinity of the site of Shechem. On coins from Neapolis that city is called "Flavia Neapolis" (Eckhel, "Doctrina Nummorum Veterum," iii. 483 et passim). 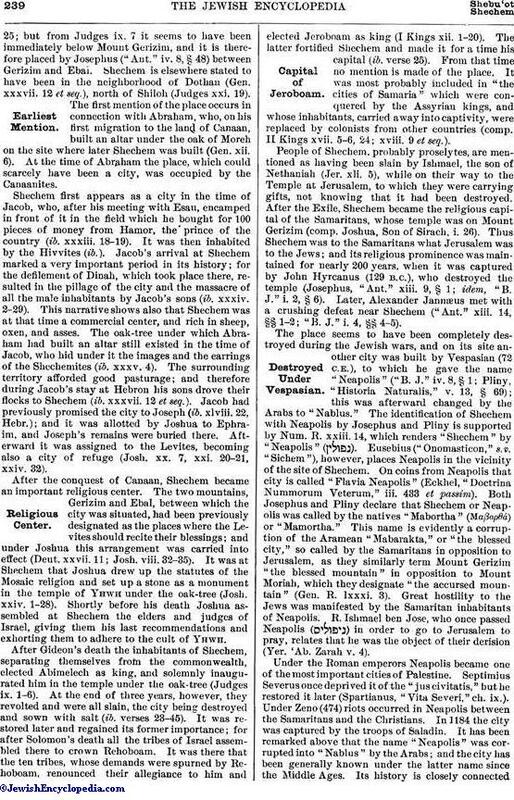 Both Josephus and Pliny declare that Shechem or Neapolis was called by the natives "Mabortha" (Μαβορθά) or "Mamortha." This name is evidently a corruption of the Aramean "Mabarakta," or "the blessed city," so called by the Samaritans in opposition to Jerusalem, as they similarly term Mount Gerizim "the blessed mountain" in opposition to Mount Moriah, which they designate "the accursed mountain" (Gen. R. lxxxi. 3). Great hostility to the Jews was manifested by the Samaritan inhabitants of Neapolis. R. Ishmael ben Jose, who once passed Neapolis ( ) in order to go to Jerusalem to pray, relates that he was the object of their derision (Yer. 'Ab. Zarah v. 4).